Another favorite castle in Ireland is Carrigaphooca Castle. This castle, Caisleán Carraig a' Phúca in Irish, means Castle on the Rock of the Fairy. Carrigaphooca was built in 1436, by Donal McCarthy of Drishane and is a ruined five storey rectangular tower house, situated on a steep-sided rock and overlooking the River Sullane. It is located 3 miles west of Macroom in County Cork, Ireland. The castle went through some restoration in the 1970's. The ground floor chamber is lit by small off-center windows, and is flanked by a straight mural stairs which rises as a spiral to the 4th floor level. It is a very simple building with a single room on each of its five levels. The windows are very plain in form, small and narrow, and like other early tower houses, there are no fireplaces or chimneys. The most interesting thing about the castle is that is known locally as one of the most hauinted in Ireland, and of course haunted by a Phooca, which is a ghost or a spirit. As I was doing a haunted tour in Ireland, I tried to learn a bit about the castle but could only find information that said it was haunted by a malicious spirit. I did read one story that said it was haunted by 24 phoocas! I decided I must investigate and new the best way to see it, would be to add it to an upcoming tour. I think that is why our tours are so popular, we always leave room for a bit of exploring. When we arrived in Macroom, I did something very unmanly and stopped into a local pub to ask directions. The whole pub immediately surrounded me and began to tell me ghost stories of the castle and how to get there. They said that I could not miss seeing the castle, as it sat high upon Fairy Rock. They were right, as we could not miss seeing it but we had no idea how to get there! We drove all around the castle, seeing it in the ditance but finding no way to get to it. I decided I would do the unmanly thing again and I stopped at a farmhouse to ask how we get to the castle? The owner greeted me warmly and said he would be back to me in just a moment. He returned to the door and handed me a key asked that I be sure to loch up when we left. As the only way to the castle was through the farmyard and a field, we carefully picked our way through the sheep droppings and made our way to the castle. We had to go up a short flight of stairs so that I could unlock the door. At the top of the stairs we all immediately felt a whoosh of cold air fly by us and the hair on the back of our necks stood up! Might have been that is was October! I unlocked the door and we carefully made our way inside. Wow! I am like a kid in a candy store when it comes to castles and I had the key! We could explore to our hearts content and we undertook to do just that. The lighting was not great on the lower floor and the lower floor was all dirt. Unfortunately it had several grave like holes that had been dug into the floor. Well, after a bit of checking out what looked like graves, I had enough of the ground floor! The feeling was very much like the feeling I get in Leap Castle, which is well known as Ireland's most haunted castle. Only difference was that nobody lived here in this castle and we were all alone! We had a grand time exploring and scaring each other silly. We all felt that we were being deterred from climbing the stairs but carried on anyway. The views from the top of the castle were incredible and were well worth fighting off all the spirits that hindered our way! What an experience! Just another day in the life of a small group tour operator. 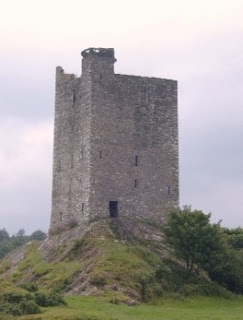 Picture of Carrigaphooca Castle near Macroom, County Cork, Ireland. We offer loan from a minimum amount of 50,000.00 to 20 million Euros,Dollars & Pound-sterling at REBECCA WILLIAMS LOAN FIRM. Are you looking for loans for all kind of purpose,a Business Loan, Personal Loans, Mortgages, Car Loans, Debt Consolidation Loans, Unsecured Loans, Risk capital, etc. ..
You are well-come in the right place Your loan solutions! I am a private lender who lends Individuals and Businesses at a low interest rate and affordable Interest rate of 2%. 100% guarantee for serious customers.